Brandon Hayakawa, seen scoring a touchdown for the Lakers last year, was allowed to transfer to Truckee for his senior season after learning that North Tahoe was forced to cancel its 2014 campaign due to a lack of players. TAHOE CITY, Calif. — The North Tahoe football program finally reached a worst-case scenario. 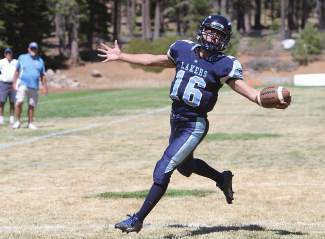 After grappling with numbers for the better part of the past decade, longtime North Tahoe head coach Scott Everist was forced to cancel the Lakers’ football season after only eight players showed up for the first day of practice. The announcement comes after a relatively successful 2013 campaign in which the Lakers made a move to independent status and switched to eight-man football for the first time in school history. It was supposed to be the start of a rebuilding era, with still two more years as an independent and optimism that the Lakers could steadily build their numbers. That 2013 squad, which started out with 14 healthy players, won its first two games before losing its final three. Halfway through the season, several players lost interest and quit, Everist said. “They just weren’t into it. We get these kids who come in and they’ve never played before. They don’t know and understand football,” Everist said, adding that every year the Lakers have a handful of talented and experienced players — just not enough of them. One player who fits that bill is Brandon Hayakawa, who excelled his junior season as a speedy and athletic quarterback. Fortunately for Hayakawa, he will get to play his senior season. Everist said that due to North Tahoe canceling its season, he was allowed by the NIAA to transfer to Truckee without having to sit out a year, which is normally required for transfer students. He’s listed as a running back and safety on the Wolverines’ roster. North Tahoe didn’t always struggle to field a team. The Lakers were once a proud program with enough students to compete among the NIAA’s Division I-A ranks (formerly 3A). The school began steadily declining in enrollment in the mid 2000s, however, and dropped to the Division III (formerly 2A) in 2006. School enrollment has now dipped to roughly 300, Everist said. Despite the tough times, all is not lost for North Tahoe. Everist hopes this is the first and only season the Lakers’ have to forfeit entirely (they forfeited a handful of games in recent years, always due to dwindling numbers late in the season).